Change Comes From Within… Wine Jugs. – ACRONYM Inc.
Change Comes From Within… Wine Jugs. In 1995 I found a gallon wine jug that wasn’t being used anymore, mostly because my friends and I had drained it. I cleaned it, peeled the labels off, and immediately began putting my change in it. I was inspired to do so by a variety of people. My roommate, The Ramen City Kid, had a penny jar, and around this time my friend Justin was able to afford a trip to Europe funded by tips he’d saved in a jar. It seemed like the thing to do, and there was something very Country Mouse about saving money this way. My problem, of course, was that I was almost always broke when I started this habit. For many years, the jar remained fairly empty. At the end of the month I would desperately need to buy food, so I’d spill the contents of the jar on my bed, pick out the silver, and survive for another few days. I would have idle fantasies that, someday, the jar would actually be full. What I would do with it when it was full, I couldn’t say. But it would be a glorious day, indeed. Flash-forward to three years ago. Suddenly, I noticed that I hadn’t had to dig into the jar in quite some time. Not only was the level of coinage going up, but I was adding to it almost every day, and never needed to dip in anymore. Soon, the jar became almost too heavy to lift with one hand. I tried to forget that it was even money, and when I did think of it in those terms, I tried to pretend it was all pennies. For some reason, it didn’t seem as valuable that way. In the back of my mind, it was my other other savings. For what, though, I wasn’t sure. Until I checked the balance of my account last week, and noticed that the economic crisis was finally hitting me, too. Normally this only happens at the end of the month, and I can sit a few days out of my usual routine and stick closer to the homestead. But this time, there just was no denying it. For the first time in years, I had to dip into the jar. At first I was embarrassed. 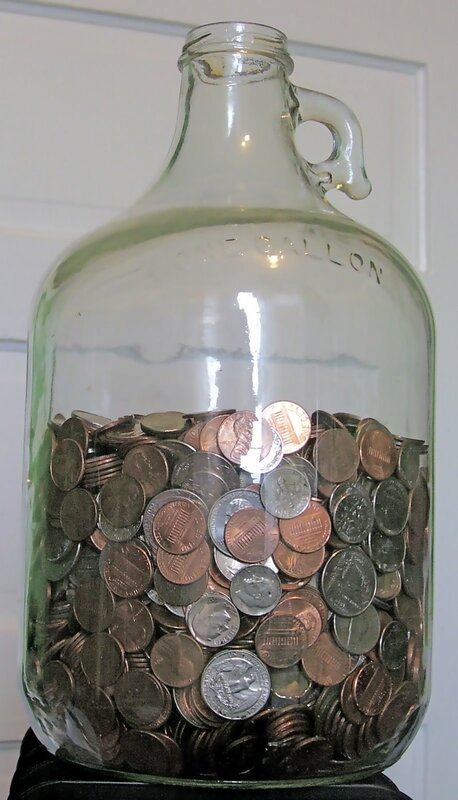 I had, finally, almost filled the jar, and was also concerned about having to carry large bags of coins with me to do my shopping. To my benefit, there is actually quite a bit in the jar now; I’ve been living off of it for the last week +, and the picture above was taken this morning. To my further surprise, everywhere I’ve gone has been really excited to see me pay in coins. “Oh, we need quarters! Thank you!” The fact that I’m still wearing residual pieces of my hobo costume from Halloween seems to add to the effect; hey, that jacket it warm! As soon as I pull out the bag of coins, I get a huge laugh, and the same exchange takes place. It’s amazing how many discounts you can get when everyone is in the same boat.